If you're coupled, you're likely looking for Valentine's Day dinner options. Since it's more fun to taste from a restaurant's standard menu (especially a restaurant you haven't been to before), we're going to head out for "Valentine's Day" on Friday, February 13. Dan has made some reservations — where to? I have no idea. While browsing for a good steak suggestion for Dan's out-of-town coworkers, I found myself looking around Kevin Rathbun's three places (Rathbun's, Kevin Rathbun Steak and Krog Bar). Rathbun's has its sample Valentine's Day menu posted — and I have to say — the $85 four-course, prix fix price isn't bad for Valentine's Day (or for Rathbun's) and the menu feels pretty robust. The one time we ate at Rathbun's, it was heaven. Mmmm. If you end up there on V-day, enjoy! Two Cheers for Two Chairs! Some of you may remember that I wrote a post back in November about the fabulous table we purchased from Underpriced Furniture. We've really enjoyed the table, its design and functionality — plus it goes so well with the rest of the living room and dining room furniture. Well, about six weeks ago, I was taking a nap when Dan burst into the room holding his cell phone. He said, "you have to listen to this voicemail!" I had no idea what it could be about and was, at the time, rather content sleeping. Hi Dan, this is Tim. I'm the owner of Underpriced Furniture. I believe your wife wrote a blog recently about the table you purchased at our store. We are so glad to hear that you all had a good experience and really appreciate that she took the time to write about it. I believe she mentioned that you all would like to purchase two more chairs. If you purchase one more chair, we would like to give one free. Just give me a call if this works for you and I'll put in the order for you. He proceeded to give us his personal cell phone number. Well, we picked up our BOGO chairs on Saturday from Underpriced's warehouse in Norcross. I'm stoked that we have the last two chairs to round out the "set" — not to mention how fabulous it is that Tim gave us one of the chairs at no cost. Dan and I went with my father and stepmother to Raleigh's Fairgrounds Market. We perused all kinds of cool antique furniture, memorabilia, estate jewelry, foods, baseball cards, fruit and more. Of course, because it was a flea market, there was a good bit of crap there, too. Also, I seemed to see a lot of this damn purse or ones like it (maybe six people carrying it and two or three vendors selling it). Do you have this purse? What is the deal with this "giraffe print inspired" bag? Apparently it's popular. 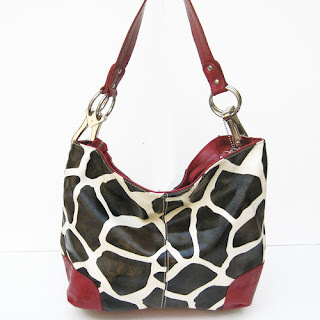 My eBay search yielded 2,051 "giraffe purses" on sale at this very moment. Okay, maybe not literally tomorrow... but the next day. I have a hair appointment* with Mary for Sunday at noon. 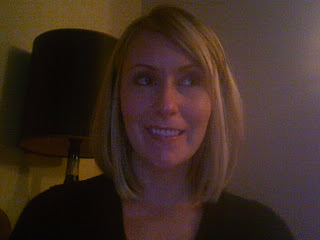 I've been itching for a major hair style change, so I e-mailed her the top two photos above. I'm crossing my fingers she does a fab job yet again. *If it's long enough, I'll most definitely send my tresses to Locks of Love. I forgot I put this post up on my other blog just under a year ago. Perfect for my "Life Fulfilled Atlanta" blog. I am by no means “good” with money or a big saver of money (this is something I am still trying to work on). I can at least say that I am good at stretttttttching my money—so I thought that these tips may help some other young professionals who need to make their money go as far as possible. Don’t be afraid to buy shoes online. I’ve bought many a great pair for a great bargain, even with the shipping included. Consider Make Me Chic and Gotham City Online. Realize that finding good deals may not be a timesaving event. Sometimes, you have to dig. This advice is best to keep in mind at stores like TJ Maxx, Marshall’s, Ross and Goodwill. The “winner” items are not just going to pop out at you; you have to look for them. Shop at Kroger or a farmer’s market. While I do enjoy the shopping experience at Publix, Kroger just offers so many more generic brands and overall options. Why not buy Kroger-brand pizzas, sugar, flour, eggs, etc.? (Note: you just can’t go generic with some things, such as ketchup, oatmeal and face wash) Farmer’s markets have produce for such a bargain compared to any local Whole Foods. Plan gift giving in advance. You can find an incredibly thoughtful gift for a friend that isn’t as expensive as waiting until the last minute. Funky jewelry, luggage tags, home goods, purses and bags, stationery, etc. can all be found at a better deal (in-store or online) if you give yourself some lead time in the hunt. Take a chance on an “amateur” hair stylist. At Van Michael, for example, a “New Talents” stylist can cut your hair for about $25 to $35 (depending on the level of skill) and a color stylist can do your color for about $80. If you’re going to a nice city salon, you’re probably spending a lot more than this. The New Talents professionals at Van Michael have attended cosmetology school, been through rigorous VM training and are tested regularly on their skills. Have your friends over for dinner instead of going out. A great homemade meal, wine and friends make for a nice, yet inexpensive, evening of fellowship. Pack your lunch. Yes, it is important to get out of the office every now and again, but this can be dangerous to the pocketbook and to the waistline. Try making a tuna sandwich or throwing a Lean Cuisine into your work bag on the way out the door. Three dollars for a packed lunch versus $7 for a restaurant one really adds up over time. When's a better time to declutter your closet and drawers than at the beginning of a new year? I spent an hour and a half today going through each drawer in my dressers and each section of my closet. I asked myself if I've worn or used certain items in the past year. I was amazed to realize I was holding onto so many articles of clothing I hadn't touched in years. The outcome was two large trash bags at their max capacities. These extra clothes, purses, shoes and accessories will be more loved by someone else — and can help create positive change in my community. I don't mind the free space I created either. I also started a plastic crate of my very favorite clothes that I would like to keep for my children and grandchildren. My grandmother did this and boy did I think that was cool. These are all items that are in good shape but either don't fit any longer or are long out of style. While I do donate some items to the Junior League of Atlanta's Nearly New store off Howell Mill because I'm an active member, I am also partial to Goodwill. The Junior League's store proceeds go to the organization. "Women Transforming Communities" is the club's tag line; the League's donations and volunteer hours help many organizations around town ranging from the Atlanta Botanical Gardens and the Genesis Shelter (for homeless woman with infants) to the Atlanta Speech School (started by Junior Leaguers) and the Chastain Park Therapeutic Riding Program. Nearly New is primarily staffed by Junior League volunteers (like me!). Click here for a list of 2008-2009 community partners. Goodwill's focus is creating work for those who might otherwise be unemployed or without mental and physical exercise. Goodwill has plenty of employees working the shops' floors that are not mentally, financially or physically disadvantaged but many of the employees are. My mother worked for one of the Goodwill regional offices and told me how the clothes are organized by color instead of by size because color is much easier for some employees to understand and organize by. Donations (monetary or in clothing, furniture, shoes, etc.) to either organization are tax deductible. Both Goodwill and the Nearly New store accept men's and women's clothes. Visit Goodwill of North Georgia's site to learn more or to locate a store and/or donation center near you. Click here to see directions and information about the Junior League's Nearly New store. Go here to learn more about the Junior League in general. And here's a great blog called "Declutter It" I found about decluttering. Happy New Year! And happy decluttering.